So I was putting up some fabric on the store site yesterday and came across a collection by Jennifer Chiaverini - Anneke's Collection for the Elm Creek Quilt's fabric line. I stopped for a minute and thought - that sounds familiar. 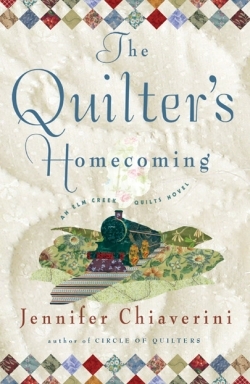 Today I was on Good Reads and was rating books I read and came by The Quilter's Apprentice by Jennifer Chiaverini and then I remembered! I had read her books and now I was looking at a bolt of fabric designed by her! I don't know about you but I really get a kick out of these things! Congratulations on your new job at the quilt shop! Is it online only or brick and mortar too? Sounds like fun, I'm sure it must be very inspiring. Elvira... I guess Flipkart might have it... we found it a seconds book store. Did you read The Friday Night Knitting Club?